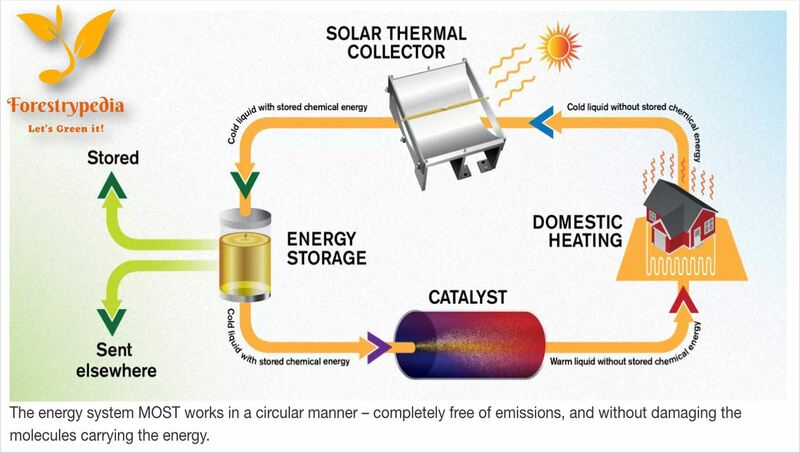 How does the Solar Thermal Fuel store Solar Energy? How much Energy the Solar Thermal Fuel can store? There is no doubt in it that Solar Energy is not only abundant but also renewable. Yet, solar power has a thorn in its side. There is still no cheap and efficient long-term storage for the energy that it generates. Oil drop abstract Solar Liquid. The fluid is actually a molecule in the liquid form that scientists from the Chalmers University of Technology, Sweden have been working on improving for over a year. This molecule is composed of carbon, hydrogen, and nitrogen, and when it is hit by sunlight, it does something unusual: the bonds between its atoms are rearranged and it turns into an energized new version of itself, called an isomer. The process is simple enough to explain, the energy from the sun is captured between the isomer’s strong chemical bonds, and it stays there even when the molecule cools down to room temperature. When the energy is needed – say at nighttime, or during winter while Solar Energy is not available – the fluid is simply drawn through a catalyst that returns the molecule to its original form, releasing energy in the form of heat. The renewable, emissions-free energy device is made up of a concave reflector with a pipe in the center, which tracks the Sun like a sort-of satellite dish. The researchers have put the fluid through this cycle more than 125 times, picking up the heat and dropping it off without significant damage to the molecule. “We have made many crucial advances recently, and today we have an emissions-free energy system which works all year round,” says Moth-Poulsen. After a series of rapid developments, the researchers claim their fluid can now hold 250 watt-hours of energy per kilogram, which is double the energy capacity of Tesla’s Powerwall batteries, according to the NBC. The energy (warmth) produced can be used for many purposes before heading back to the roof once again.